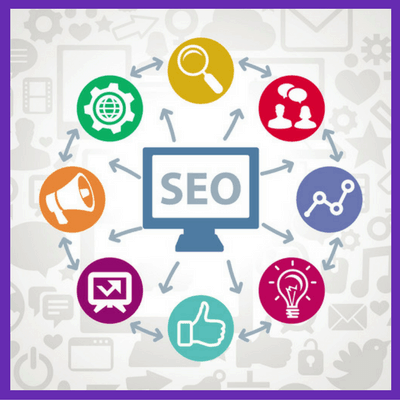 SEO stands for search engine optimization and is basically where one makes changes to a website (optimizes) to make it more… ready for it… search engine friendly. However, it not only helps the search engines find your website, but it can be helpful for the consumer as well. Search engine optimization has four main parts – keywords, links, titles and tags. When your website is optimized, on all pages, for these things, you have the basics down and have higher odds to be shown on the search engine results pages higher in the rankings. Wait… what? Search engine results and rankings? Let’s step back for a second to determine where this SEO thing can be beneficial. When someone types in a search phrase into a search engine, Google for example, it brings up a listing of results, called the search engine results page (SERP). On this SERP there are typically ten organic and there are also typically ten paid results on page 1 and then you click next to get to page 2 and the next ten organic and paid results for that one keyword phrase. The user will scroll through that list of results and hopefully select one of the links and go to that website in hopes of finding what they want. Or, they will go to the next page of results or they may type in another keyword phrase. Remember most users won’t click that next link to go to the second page of results. 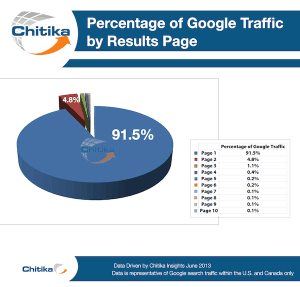 Search Engine Watch wrote an article about a Chitika study on SERP positions and page traffic. It was determined that 91.5% of Google traffic clicked through on page 1 of the SERP, 4.8% traffic clicked on page 2, 1.1% on page 3, .4% traffic on page 4 and then it decreases slightly for each page deeper into the search engine results. It was also determined that of the top ten organic results (page 1), 33% of the click through traffic was on the top result on the first page, 18% clicked on the second position and again decreases the further you proceed down the search engine results. So, the point here is to be as high as you can on the organic search engine results and to do your best to stay there for the keywords that are important to your business. How do I get on the first page or position of organic search results? There are no guarantees and the Google algorithm makes sure of that, hence the reason why it is such a secret. You may remember hearing about the Google Penguin or Hummingbird update, well those were just two of the many updates Google makes to their algorithm. The good news is that any business that follows the white hat (ethical) practices of SEO (there’s that word again) can move higher up the search engine page results with continued efforts. This isn’t a do “this” and be done solution either. There are several things (remember the 4 pieces of the puzzle) that search engine marketers can do to help websites move up the search engine ranking totem pole. If you have ever heard the phrase “content is king”, you could guess that a lot of SEO has to do with your content. Content keyword density, content to html ratio and keyword rich content are all very important. Similarly, having your meta data with unique keywords are also a must for the best search engine optimization. We don’t expect you to know what all this “stuff” is, but this is where we can help. We would love to explain these things to you as we help you and your website move to a more visible listing in the organic search engine results. And one last thing on that, if anyone claims they can guarantee the #1 position on page 1, RUN! Search engine optimization is one of those things that you don’t do all at once and are done, but is something that takes monthly efforts that continue for as long as you have a website. Changes made on day one may not be seen for a month, two or maybe three. How is that you ask? Well, the short version on that is that your website is indexed (crawled by search engine spiders) as you update your content, usually monthly. If you create a website and leave it, the search engines will see that there is no need to crawl your website and won’t bother wasting time on your website, but will crawl the ones that need attention because they are updating them. Do you see how this could be detrimental to your website? One great way to ensure you update your website regularly is to create a blog and to post to it at least monthly. Plus, this is a great way to connect to your consumers. Hello?? This is win-win! You provide important and relevant content to your consumers and you give the search engines a reason to crawl your website. Be sure you optimize your blogs too, ugh, I know, right! Again, if you need more help, want more information or just want to grasp this “stuff” a little better, check out the rest of our site, check out some of our blogs, contact us with your questions or shoot, just give us a call at (757) 679-8348. We’d love to help your business be more visible, after all, our mission is your visibility!